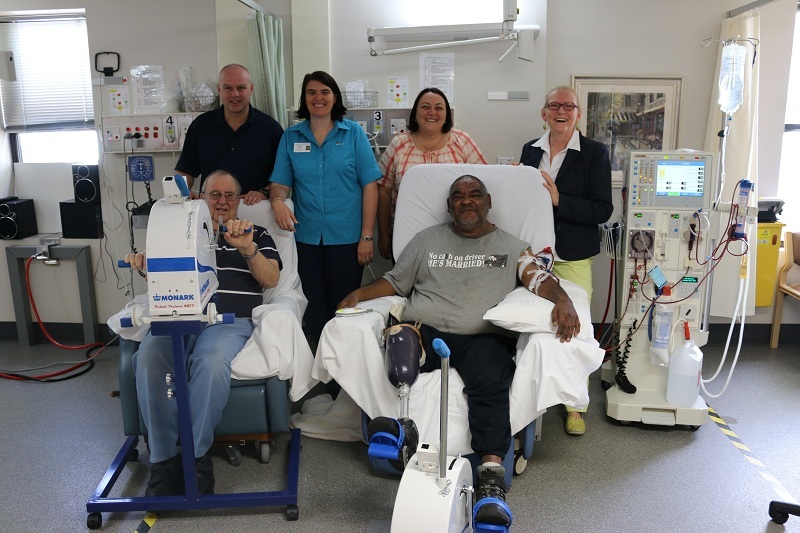 This week around 11,000 Australians will spend several hours hooked up to a dialysis machine, restricted and confined to a comfortable chair until the complex process is complete. Making better use of that time and improving the overall health of patients with kidney disease is the aim of a project being trialled in Armidale by UNE honours student Debra Carlson. Using an ergometer exercise cycle, patients taking part in the study now spend up to two hours pedalling while attached to the dialysis machine. The health outlook for patients who suffer from chronic kidney disease – or renal failure – is often bleak unless they can adjust to substantial lifestyle changes, including a strict diet and regular exercise. Ms Carlson says this research is helping patients increase their fitness and improve their cardiovascular health, which is important as heart disease is the eventual cause of death for many dialysis patients. Exercising patients have a better overall quality of life. 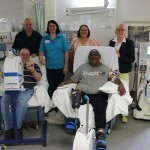 As part of the program, patients at the Armidale Rural Referral Hospital exercise with an ergometer cycle for 30 minutes during the first two hours of each dialysis treatment. Patients who are unable to cycle with their legs use a specially designed ergometer which they cycle with their arms. Ms Carlson has been conducting the research under the supervision of Associate Professor Neil Smart and Dr Gudrun Dieberg from UNE’s School of Science and Technology. Julianne Oxley, renal dietician at Armidale Hospital, is grateful for the work being done by Ms Carlson, Associate Professor Smart and Dr Dieberg. “The patients are happier, and the exercise improves their appetite, which is important as many dialysis patients become malnourished. There are really only positives to this program,” she said. Associate Professor Smart, Dr Dieberg and Ms Carlson have also conducted related research on blood pressure management with exercise. Their paper will soon appear in the prestigious medical journal, Mayo Clinic Proceedings. “As the kidneys exert major blood pressure control effects, we may trial isometric exercise in renal patients next year,” Professor Smart explained. Photograph: Armidale dialysis patients Terry Seaberg and Ian Davis exercise during their dialysis treatment under the supervision of UNE Associate Professor Neil Smart, Armidale Hospital Renal Dietician Julianne Oxley, UNE Honours student Debra Carlson and UNE’s Dr Gudrun Dieberg.